As we made our way across the eastern part of the country we played Musical Bikes. We drew bike names out of a hat prior to our departure. At each fuel stop we switched seats (and keys, thankfully) to allow ourselves a chance to sample the pleasures and pains of various manufacturers, and to contort our bodies into different shapes for the next 120 miles. So, without further ado, I give you my impression of each machine in order of the riding stint. I’ve anticipated riding The Bull for several years now. It had been lurking in the bowels of Ted’s carriage house, tempting me. I came very, very close to actually riding it earlier this summer, but the drive belt snapped before I was handed the keys. I finally got my chance this time and I was not disappointed. 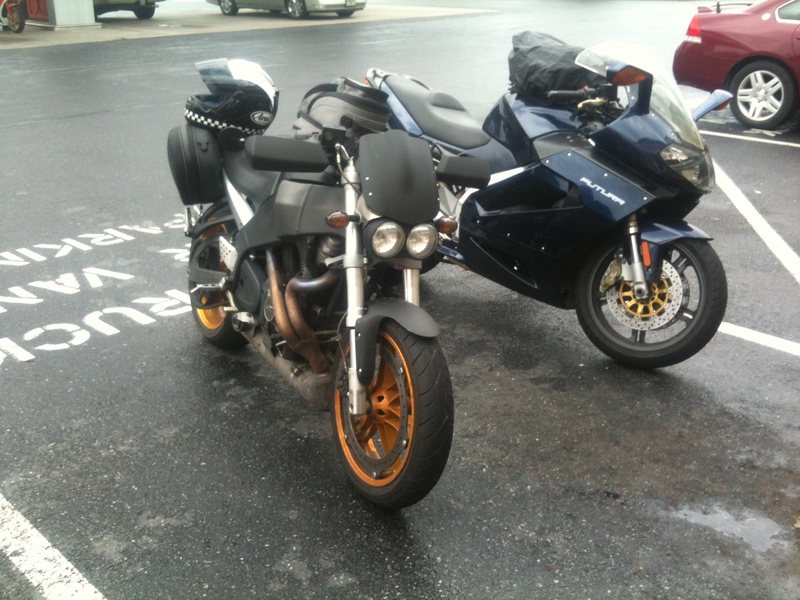 A Buell is essentially the inverse of every other bike made, in every possible way. The tank is the airbox. The frame is the tank. The swingarm is the oil sump. It is so bizarre; I fully expected the headlights to be the brake levers and the tires to be the seat, made of chocolate. The engine is a big-inch Harley V-twin. The geometry is that of a 250cc MotoGP bike. It is small. It is big. It gets 60mpg. It has a range of 130 miles. It is frustrating. It is rewarding. It is not without its faults, however. The seat is fine for about 100 miles, but not much more. The footpegs cramped my knees after 80 miles. The mirrors leave a lot to be desired. The vibes of the Harley twin were so bad that trying to see the Goldwing behind me was like looking through a periscope to see a tennis ball holding a flashlight. Still, it is an endearing ride. I climbed off the bike and made the exclamation “What a weird, delightful little bike!” Erik Buell should be proud. 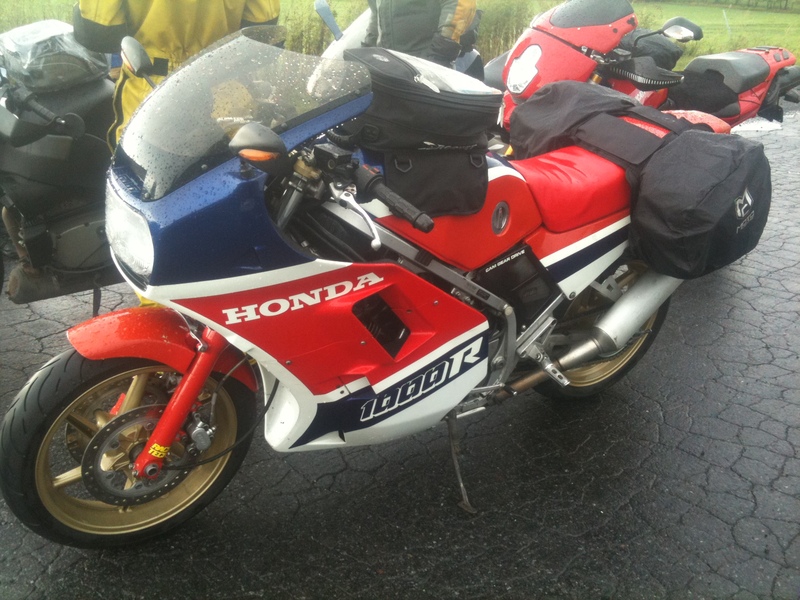 This is another bike that I’ve been lusting after, only this time for 26 years. Ben along with help from his brother Steve, have made this bike into a rather special machine. 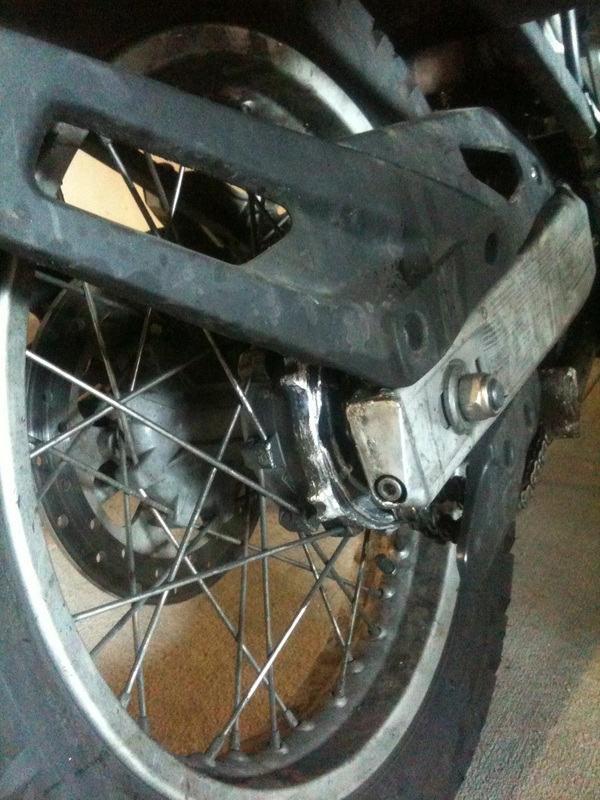 The front suspension and brakes are from a CBR600F2, with Race Tech internals. The rear is a fancy Hyperpro item, its purple hue contrasting with the Americana theme Honda was so keen on in the ’80s. The exhaust was fabricated by Steve, utilizing Ducati silencers that have been gutted and repacked. The carbs have been jetted with a proper dyno tune. The result is a bike that goes, stops, and handles exactly like I had imagined it would for all these years. It is comfortable for distance and entertains you with amazing sounds. A whir gives way to a midrange growl, with a snarling bark up top. Flat-crank V-4 bliss! Leaving the Turnpike service plaza and attacking the on ramp, I found myself channeling Freddie Spencer at Laguna Seca in 1986. I couldn’t have been any happier. Climbing back on my bike is always a revelation. It is, in many ways, a Mille sportbike with saddlebags and the best seat in all of cycledom. It is aggressive, yet comfortable, save for the nasty wind noise spilling over the windshield. (Earplugs are a must with this bike.) It manages to be smooth over the bumps and is very capable in the corners. The engine is throaty, but refined with a nice midrange hit and a big top end pull. Admittedly, I have modified the exhaust with an AF1 H-pipe and gutted/repacked the underseat silencer. (Sadly, it still isn’t to my liking.) I averaged 48mpg on the highway. 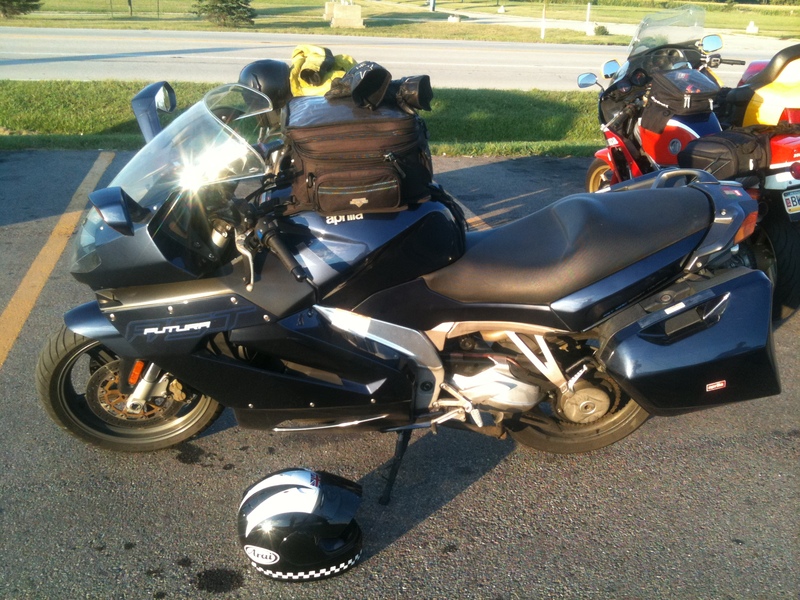 Not too bad for a bike that can haul all your luggage in hard bags, cruise all day long, and still top out at 150mph. This bike is a keeper. A bike with quite a history, I’ve been staring at the pile of parts in Steve’s garage that this was for the past 2 years, wondering what it will become. Steve actually won this bike at the Honda Homecoming in Marysville, OH. It is one of those situations where I am certain it was just meant to be. He picked it up in Marysville and immediately took it on a long trip through Wisconsin with his family. He’s used it to commute on for several years before stripping it down to sort it out to his liking. Off came the stock suspension, to be replaced with Traxxion Dynamics items front & rear. The braking system has been completely gutted and replaced with CBR954RR 330mm rotors and 4-pad calipers & radial master cylinder from a Ducati 749 in the front. Braided stainless steel lines were used front & back as the linked brake and ABS systems have been bypassed. 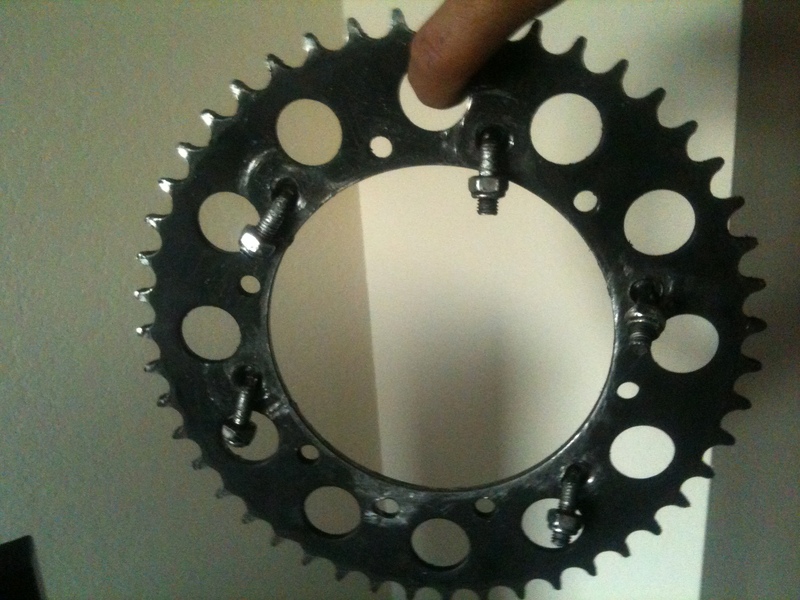 It is a better bike for it, with good feel from the lever and a strong urgency to stop. You, the rider, are finally in control of which wheel you wish to stop. Fittingly, I rode about 20 yards on this machine before hitting the interstate. 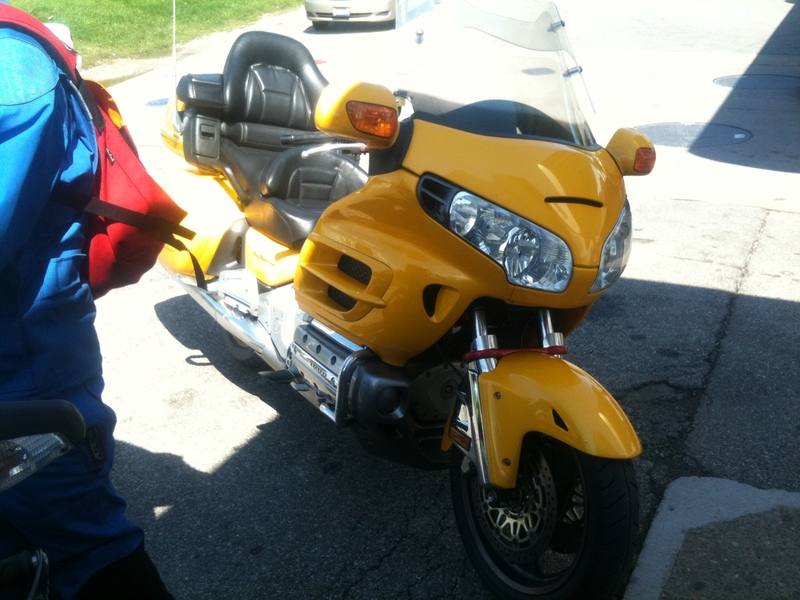 Once underway, it immediately became apparent why Goldwing riders choose this machine. 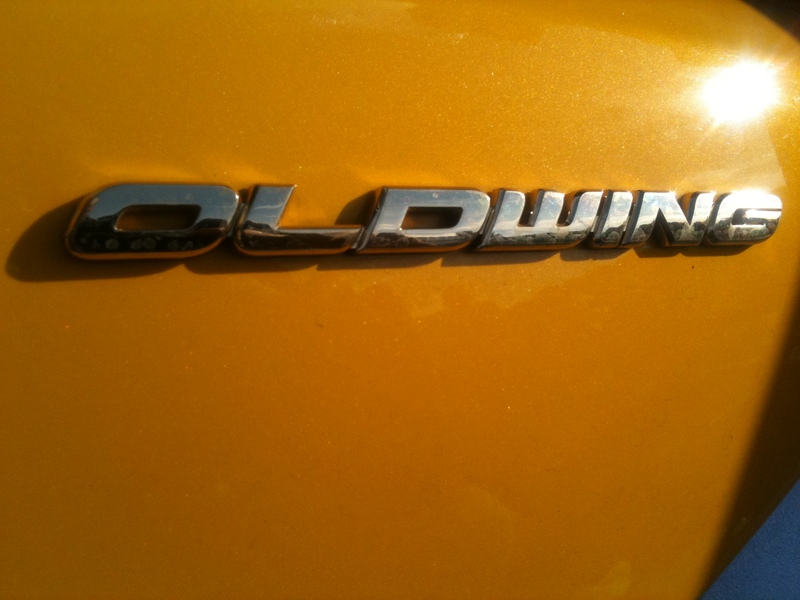 (I suppose if they chose anything else, they wouldn’t be Goldwing riders.) I got it. It is eerily smooth and quiet, with a big padded seat and more armrests than most theaters. The wind was completely blocked by the wall of yellow plastic in front of me. In fact, it was blocked so effectively that I found myself sweating from the sun beating down on my black Spidi jacket. I also noticed it demonstrated a strange tendency to veer toward the nearest smorgasbord. Another troubling issue I encountered within the first 5 minutes of riding was my ever-present wrist cramp. I thought this machine might save me from the normal pain, with its cruise control and laid-back ergos. Instead, I was numb almost immediately, only this time in my left wrist, from hitting Seek on the radio controls. Eastern Ohio’s FM selection is dismal. 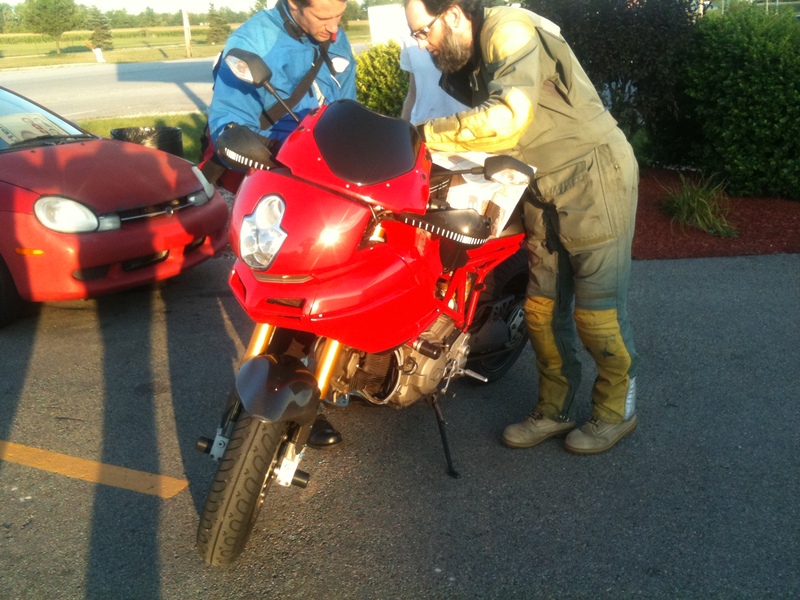 On the west side of Columbus we exited for a fuel stop (or a “Buell stop”, as it became known) and I decided to put the mods to the test. The big beast turns in sharply, allowing me to drag my right toe the whole way through the corner. No muss, no fuss. I was brimming with confidence as I pulled up to the pumps, stopped sharply, shut it off, and nearly toppled it to the ground; implementing all three of Newton’s laws in the process. My shoulder still aches from saving it. I have had several rides on the MultiStrada and each time I am amazed at how capable it truly is. The S-spec gets you the flashy carbon bits and bobs, but also gives you the Ohlins suspension upgrades. Now I had always seen the Swedish Gold as a bit more fashion than function until I rode this bike. My mind has been changed. It is as near perfect-handling as I’ve experienced on the street. If I’m honest, the bike shouldn’t impress anyone. It is ugly. The motor is the old-school 2-valve, air-cooled 90-degree twin. The riding position is upright, not leaned over for maximum front traction. Yet, when you’re on it, none of this matters. Throw it into a corner and it tracks perfectly every time, every condition. The engine thrums and booms with a fat torque curve and the perfect exhaust note. It is a very efficient highway cruiser, too, punching its small fairing through the air and giving the rider just enough protection from the elements. I could easily see myself owning this bike someday. Duke decided to join our group in Indianapolis, instead of riding out with us. Seeing as how he was in the middle of a 2-week camping tour of the Great Lakes states and Canada, I can’t blame him. His GS was packed to the gills with tent, sleeping bags, pads, and aluminum saddlebags. He looked like a rolling outfitter and I was slightly disappointed that he left his sea kayak at home. I was really hoping to get a ride on this machine, but it was not to be. Duke’s cush drive split on I-65, still in Indianapolis, rendering the bike immobile. He got it back to the hotel with BMW’s roadside assistance program (on a Sunday evening!) and ended up riding the back of the Goldwing home so he could retrieve the bike with his truck & continue on his journey later that week. It was disappointing, to say the least, but it could have turned out far worse. He could have been stuck in Dayton. All telling, it was a great trip with good friends and a motley crew of bikes that seemed to draw people in wherever we stopped. 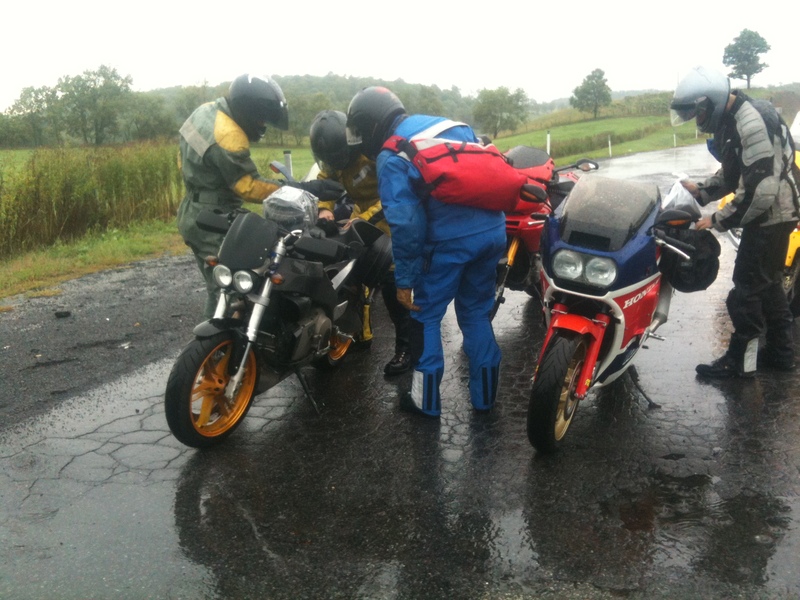 Granted, there were a few sad instances of unreliability that cost us a few hours (The Buell plug wires failed during a downpour on the Turnpike and the aforementioned BMW sprocket parting ways). Yet, in the end, it was such an enjoyable and rewarding trip that I find myself looking for another excuse to cover more distance on two wheels. I recommend that everyone play a game of Musical Bikes every now and then. When the music stops, everyone is a winner.